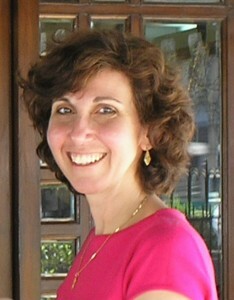 Tizku L’Shanim Rabot ~ May You Merit Many Years! When I and my family emigrated from Calcutta to Philadelphia in 1964, no one seemed to have heard of a Jew from India. I remember standing up in front of my second grade class at Solomon Schechter Day School, singing the Indian national anthem, “Jana Gana Mana”, as proof that I was really a little Indian girl…and not some Pocahontas kid. Despite the surge of interest in Sephardic culture, many people still don’t know much about the Jews of India, a group of disparate communities from Cochin to Calcutta, isolated from each other by thousands of miles as well as possessing differing origins and customs. Bombay’s B’nei Israel community claims its origin dates back to the Greek persecution that brought on the Maccabean revolt. The Jews of Cochin, in South India, trace their roots back 2,000 years, although the earliest documentary evidence of the settlement dates from the eleventh century CE. Many Portuguese Jews fled the Inquisition and made their home in Cochin. The first Jew to settle in Calcutta was Shalome Cohen, a Syrian businessman who left his native Aleppo and made Calcutta his home in 1798. He prospered and eventually became the court jeweler to the Nawab (nobleman) of Lucknow. Iraqi Jews streamed into India in the 1800s, both to try and emulate Cohen’s success as well as to escape persecutions in Baghdad from 1825 to 1831. 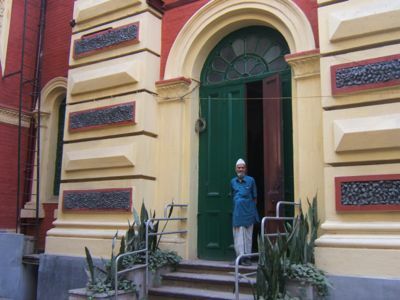 Eventually, the Calcutta Jewish community grew to a population of 5,000 at its peak in the 1940s, establishing five synagogues, two Jewish schools, a Jewish hospital and other Jewish institutions. Today, only 50 Jews remain in Calcutta. About half the community made aliyah to the newly independent state of Israel in 1948. The other half, afraid their economic circumstances would decline after India gained independence from Britain in 1947, spread out to other English-speaking countries: England, Australia, Canada and the United States. My parents, too, decided India was not the best place to raise a family any more. My father was already familiar with America: he had been encouraged to enter the rabbinate by a Jewish chaplain stationed in Calcutta. He was ordained by the Jewish Theological Seminary in New York, and went back to Calcutta to serve the community for 12 years. We went to the U.S. by ship – and although Ellis Island had been closed by then, our first glimpse of America was…the Statue of Liberty. My father became the rabbi of Mikveh Israel, the Spanish and Portuguese Synagogue in Philadelphia. He spent hours with a reel-to-reel tape player, learning the Sephardic melodies that differed from the familiar Calcutta chants. My mother, who had worked as a secretary in Calcutta then learned to cook. In Calcutta, we had relied on our Indian cook who had been trained in the rules of kashrut – as did most Indian Jewish families. Before we left, my mother followed the cook around and wrote down everything on two steno pads. At first she tried to cook, in America, mahmoosa, an egg and potato dish; beet khata, a sweet-and-sour curry with dumplings; and aloomakalas, a round, deep-fried potato that is crisp on the outside, white and fluffy within. Writing down recipes is easier than following them…We sampled a lot of burned food in those days! When my mother turned to the women in the synagogue to guide her, they taught her how to make good Sephardi foods like…chopped liver, brisket, noodle kugel, matza balls, and sponge cake! Though Mikveh Israel is Sephardi, many of its members were Ashkenazi. We arrived in the U.S. in July, with Rosh Hashanah not far off. Many Sephardi and Oriental Jews have a special Rosh Hashanah mini-seder, featuring foods that symbolize good wishes for the new year. 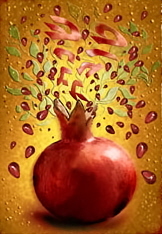 Our seder includes apple preserves spiced with whole cloves, dates stuffed with walnuts, pomegranate (“May we be as full of mitzvot as this pomegranate as full of seeds”), spinach, pumpkin, scallions and string beans. The blessings over the vegetables derive from puns on their Hebrew names that turn into wishes that our enemies should be destroyed. In Calcutta, we also used a sheep’s head to concretize the biblical hope that we should be “heads and not tails.” Understandably, we did away with this particular dish in America! Nothing acid or sour is eaten on Rosh Hashanah, such as the sweet-and-sour Arabic dish called “khatta.” Instead, the meal consists of tempting dishes like “mahmoora,” chicken cooked with tomatoes, spices, almonds and raisins, served on a bed of pilau (rice) and topped with none other than “roshinkes mit mandlen” -more raisins and almonds sauteed quickly until crisp and golden. We even dip the challah into sugar, not salt, after reciting the motzi. 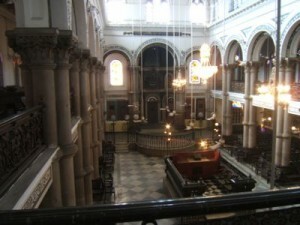 In Calcutta, the distinctive home ritual carried into the synagogue. Instead of one special Selihot service the Saturday night before Rosh Hashanah, Sephardi and Oriental Jews conduct Selihot?the special set of penitential prayers-all through the month of Elul. On erev Rosh Hashanah, a pre-dawn Selihot service began at 4 a.m., followed by the morning service and a visit to the cemetery. 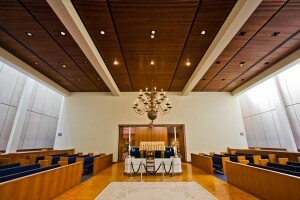 Mikveh Israel Congregation: The oldest Jewish congregation in Pennsylvania. Though I was too young to remember the synagogue observance, my parents have described Rosh Hashanah in the Maghen David Synagogue in Calcutta. At 6 a.m. on Rosh Hashanah morning, the synagogue, draped in white, began to fill with people, men dressed in white sharkskin suits (a shiny, heavy, polyster-like material). Women also wore as much white as possible. The entire service was chanted aloud, and did not end until 1 p.m. The centerpiece of the service is a poem by Judah Samuel Abbas that describes the binding of Isaac. 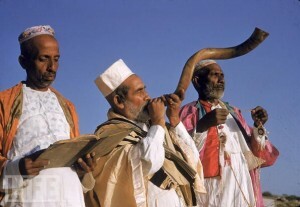 The shofar blasts also differ from the traditional Ashkenazi blasts: “teruah” is one long blast instead of nine short ones. After the Torah reading, the solemn mood of the service shifted to that of an auction, as the aliyot, ark openings and other honors for the second day of Rosh Hashanah and Yom Kippur went up for grabs. Honors for the first day were auctioned off the previous Shabbat. Though the auction prolonged the service by almost an hour, nobody seemed to mind. Only the people interested in the bidding-about half the congregation-remained in the sanctuary, laughing and joking among themselves, but still paying very close attention. Much of the bidding was done in increments of 26 – the numerical value of God’s name – until the bidding reached 101, the numerical value of the guardian angel Michael’s name. The opening of the ark on Kol Nidre night and reading the haftarah traditionally drew the highest bids. Parents bid on honors for their children as well. When the Torah was taken out, a special haftarah scroll accompanied it; this light scroll was usually carried by a child. It was also a child’s job to point to the beginning of the Torah portion with a yad, or pointer. On Rosh Hashanah afternoon, many Calcutta families opened their homes to others for the traditional reading of the Book of Psalms, accompanied by a light meal of sweets and fruit. While the distinctive Calcutta lifestyle has vanished with the dispersion of the community, my family follows many of the Calcutta customs, including the Rosh Hashanah seder. We continue to greet family and friends on Rosh Hashanah with the traditional blessing: “Tizku l’shanim rabot:” May you merit many years. The response is: “Tizke ve’tihyeh:” May you merit, and may you also live. This article was originally printed here. In a saucepan add the coconut milk and rice and bring to a simmer. Add in the cardamoms, vanilla and cinnamon and cook on medium-low for 35 minutes stirring occasionally. 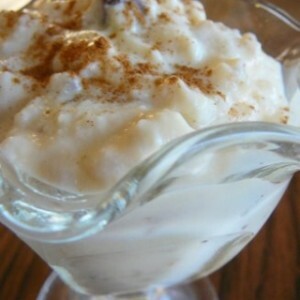 When the rice is very soft and the mixture has thickened add in the raisins and almonds if using. Stir in the sugar and cook for another 10 minutes. Sprinkle the nutmeg and rosewater and serve hot or cold. May all of us be listened to and embraced and welcomed and supported – in the comin year. 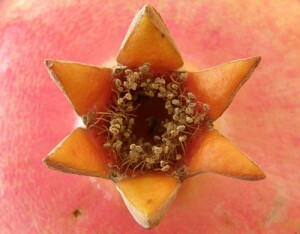 Tizku L’Shanim Rabot ~ May You Merit Many Years.